Spring has come late to St. Albert, as it has to much of the Prairies. That means I’m behind in my training for Tour du Canada. I had no sooner got out for a short training ride (as much as my legs could take) a couple of weeks ago when we got hit with another snow storm and bout of cold weather. Slowly it warmed up and finally I was able to ride three days in a row a week ago. Then, you guessed it, down went the temperatures. Two days ago I got in a slightly longer ride (57km) out through Morinville, across to Highway 28 and back to St. Albert. I hope they’re building them on stilts! There is a lot of water in the fields with the spring thaw. Certainly the fields on the edge of Morinville are no exception. 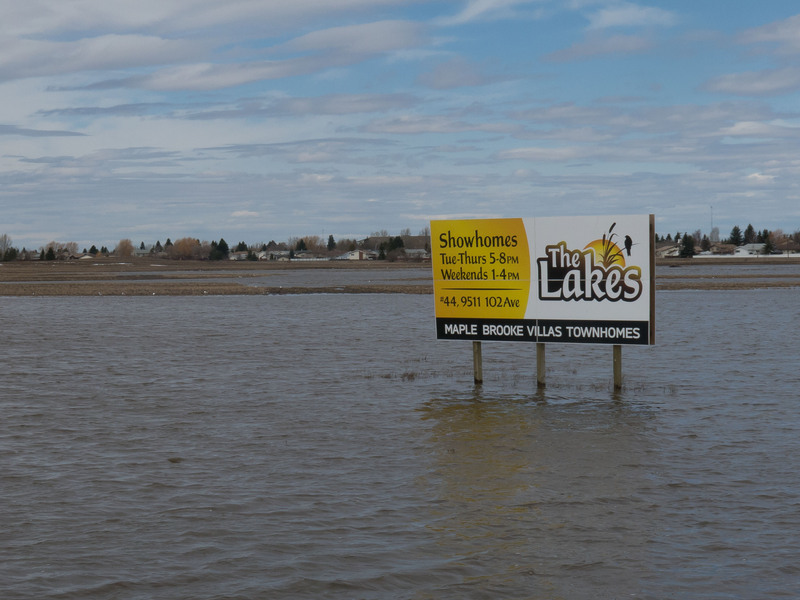 However I don’t think that the company that posted the sign advertising their new subdivision called “The Lakes” actually anticipated the sign being in the middle of the lake. Somehow I would see that as a bad omen! This morning I had company as my buddy James joined me for his first ride of the season. I could have smugly felt like the “vet” of many rides this spring if my legs weren’t so stiff! At any rate that ride put me over the 200 km mark for the Spring. Tour du Canada recommends that you get 2000 km in before you get to Vancouver for the start of the ride. They also recommend that you have done at least one century ride (100 miles or 160 km) by early June. Hey … I’m 10% there and I still have … hmmmm … a little over 6 weeks. Egads I don’t even want to do the math. I guess I’ve got a few more rides ahead of me yet! At least the lull in training has given me time to work on the renovations to the family room. I’m happy to say that I’ve now gone as far as I can go until a couple of other things happen. Hopefully the mantel will get installed this coming week. My friend Dennis has started work on the cabinets that will go in on either side of the fireplace. Once those cabinets are installed then I can lay the cork flooring, install the baseboard and I’m pretty much done and ready for the TdC. Easy peasy! I still have lots of other work to keep my busy in the meantime – the entryway from the garage and lots of yardwork. And oh yes, lest one think that our list of upcoming adventures was dwindling, this week we signed on for a 2-week river cruise in Europe (Amsterdam to Budapest) for next May with our friends Rick and Linda. Ahhhhh retirement … ya gotta love it! Ouch!!! I think my non-retired friends are thowing things at me again! This entry was posted in Cycling and tagged renovations, riding. Bookmark the permalink.